Here is the latest instalment of my 2018 reviews of very special children’s picture books. 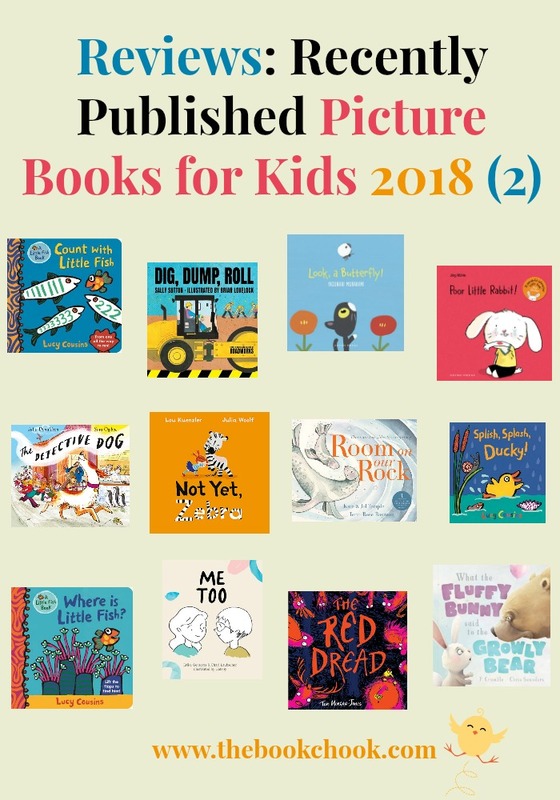 You can browse the earlier 2018 list here, and check out my Top Picture Books for 2017 here. Poor Little Rabbit is a children’s board book by Jörg Mühle, published by Gecko Press (2018.) RRP: $NZ 13.03 /$Au 12.99 BB. Good board books are an important investment for families and libraries. It’s easy to dismiss them as “something kids chew on.” But they’re often the first books we read to our little ones. We read them again and again. Kids internalise the vocabulary and develop a sense of story this way. So it’s vital to find board books that have been carefully written for a toddler audience, and show an understanding of what is important to little ones. In Poor Little Rabbit we meet a character who has hurt himself. I know kids will wince and keenly remember what THAT feels like. There’s a real sense of drama as we discover more about this scrape. I loved that Mühle weaves interactivity into the tale, inviting kids to blow on the wound, cover it with a bandaid etc. The artwork is perfectly aimed at toddlers too. Importantly, there’s a happy ending, and I know Storytime kids will be bubbling with stories about their own medical dramas to share! I think Poor Little Rabbit would make an excellent choice as a gift for a baby, and to freshen a library’s board book collection. There are three in the Little Rabbit series, making them a good choice for children who want familiar characters. Take a look at the gorgeous illustrations as you peek inside the books at Gecko Press’s website. I’ll be adding it to my list of Hilarious Interactive Picture Books for Kids. Look, a Butterfly! is another children’s board book, this one by by Yasunari Murakami, published by Gecko Press (2018.) RRP: $NZ 13.03/ $Au 12.99 BB. A light-as-a-feather story to share with the very young, told in shapes and colours. This is a very simple story that resonates with a sense of wonder and delight. Toddlers and babies will love the bright colours, the simple shapes, and the cute kitten the butterfly encounters. They will giggle over the repeated “pop, pop, pop” too. I can just see Dads and babies having a ball as they find silly and creative ways of "popping" like the flower buds in the story. This is another good gift - for toddlers, babies - and recommended too for libraries. It’s sturdy and will also work well at a toddler Storytime. The Detective Dog is a children’s board book by Julia Donaldson and Sara Ogilvie, published by Macmillan Children’s Books (2016.) RRP: $Au 14.99 I have previously reviewed Donaldson’s What the Ladybird Heard on Holiday, The Everywhere Bear and The Scarecrow’s Wedding. Ogilvie’s illustrations are colourful and detailed, and will be relished by groups of children or individual kids. However, the board book’s size is 19cm x 17cm, meaning it is smaller than the average 32 page picture book I would choose for sharing with a large group of children. This is offset by the fact that the book is glossy boards, meaning it is incredibly sturdy and ready for the rigour of being a library book. I recommend libraries purchase both this board book perhaps for younger kids, AND the more conventional hard back picture book format (RRP: $Au 24.99) because I know different groups of kids will respond very well to both. Aside from being a fun romp, The Detective Dog also underlines the importance of libraries and books in our lives, and would be a great one to share with kids during Children’s Book Week Australia, 2018. I am also adding it to my list of Children’s Picture Books with Strong Rhyme and Rhythm. Splish Splash Ducky is a children’s picture book created by Lucy Cousins published in Australia by Walker Books (2018.) RRP: $Au 24.99 HB. Previously I have reviewed Cousin’s Yummy, and Hooray for Birds, and most kids would know her Maisy books. A colourful, rhyming book showing the joys of a rainy day. A delightful story that highlights the special bond between father and child. I have always loved Cousins' books. They are perfectly targeted at their intended audience. The bold illustrations and use of primary colours really appeal to young children. Splish Splash Ducky combines this attractive and colourful art work with bouncy rhyming text. There’s also a simple “Quack, quack, quack” chorus that little ones will delight in joining in with. I heartily recommend Splash Splash Ducky to public libraries, families of under 6’s and to school libraries that want lovely clear and simple-to-read picture books for young learners. Room on Our Rock is a children’s picture book written by Kate and Jol Temple, illustrated by Terri Rose Baynton and published by Scholastic Press (2018.) RRP: $Au 24.99 HB. Previously I have reviewed I Got this Hat. I think deep down, all of us know the world gets along better when we share. Here’s a picture book that makes a useful resource for encouraging kids to think about sharing with other kids, and of course the wider implications about welcoming others to our country and town. Kids will be intrigued by the way the story can be read both forwards and backwards. There’s occasional rhyme to delight the ear, and Baynton’s limited palette illustrations are subtle. I particularly enjoyed the expressions on all the aquatic creatures’ faces. I’ll be adding Room on Our Rock to my list of Picture Books that Celebrate Diversity. I’m also adding it to my list of Children’s Picture Books about Change, because this picture book can be used to demonstrate a change from one way of thinking to another. Dig, Dump, Roll is a children’s picture book by Sally Sutton and Brian Lovelock, published by Walker Books. RRP: $Au 24.99 HB. Previously I have reviewed Ambulance Ambulance, Roadworks and Construction. Crash-a-rumble Smash-a-grumble What’s at work? Here’s a clue: It will clear the ground for you. Bulldozer! Coming through! This is the follow-up to Roadworks that will delight tiny truck enthusiasts. It's an engaging, interactive text that asks readers to guess what kind of vehicle is at work. Visual clues alongside the text help ensure that our readers are challenged but can still be successful with their guesses. In the end, the vehicles work together to build a surprise. I have a huge soft spot for the Sutton and Lovelock picture books. This is largely because I have seen the look of total joy on little boys’ faces when they discover these books! Dig, Dump, Roll asks kids to use visual cues to predict an answer to the questions about which machines are doing the work. There’s wonderful rhythmic and rhyming text to enhance the game, as well as great sound words for children to enjoy. Lovelock’s illustrations are bright, colourful and realistic enough for the most avid fun of things that go. A must as a gift for kids who love trucks and machines, and also for libraries everywhere. Not Yet Zebra is a children’s picture book written by Lou Kuenzler, illustrated by Julia Woolf and published by Faber (A and U) (2018). RRP: $Au 14.99 PB. Annie said to the animals, 'Please stand in a line. I'm painting my alphabet. Come one at a time! Annie wants to paint an alphabet using her animals, but Zebra simply can't wait until the end for his time to shine. Sneakiness, silly costumes and plain pushiness doesn't get him anywhere - but he has to learn to wait his turn! Annie may be the assertive little character who sets up the story, but Zebra certainly steals the show in this rhyming picture book. It’s also an alphabet book - we meet the animals ostensibly in alphabetical order of Aardvark, Bear and Crocodile but OOPS, here’s Zebra. And here Zebra continues to be, donning hilarious costumes and props in an effort to be next in the alphabetical line. The illustrations are wonderful! Woolf has provided child readers with lots of paint splashes, daubs and child-like drawings to add realism to the idea of Annie’s art project. The actual animals are engaging, colourful and expressive but again, it’s Zebra kids will love, whether he’s pretty in pink as a flamingo, peeking out of a newt suit, or aping a monkey in a pair of cardboard ears. The final double page spread is a gallery of all the animal art work and the end papers feature Zebra contorting his body into each letter of the alphabet. Not Yet Zebra is an excellent resource for early childhood or K-2, and I heartily endorse it as a resource for libraries everywhere. Count with Little Fish is a children’s board book by Lucy Cousins, published by Walker Books. RRP: $Au 11.99 BB. Where is Little Fish? is a children’s board book by Lucy Cousins, published by Walker Books (2018.) RRP: $Au 11.99 BB. A beautiful lift-the-flap book from Lucy Cousins, multi-award-winning creator of Maisy! Babies and toddlers will love this playful search-and-find adventure. Lucy Cousins' books have sold over 30 million copies worldwide and are available in 29 different languages. Previously I have reviewed Cousin’s Yummy, and Hooray for Birds. Most kids would know her Maisy books. As I said in my review of Splish Splash Ducky, above, Cousins is a master at using primary colours and bold illustrations to appeal to kids. Where is Little Fish? combines this with something else that children love - lifting sturdy flaps to reveal something hidden! Count with Little Fish encourages kids to count to ten, and does so while providing them with numerals filled with attractive designs. They can run their fingers over the numerals to trace them, then count the different accompanying groups of fish. There is also another board book in the series called I am Little Fish. It comes complete with finger puppet and looks just as cute as the two above. What a great set these three would make for home, preschool and libraries everywhere! The Red Dread is a children’s picture book by Tom Morgan-Jones, published by Barrington-Stoke (2018.) RRP: $Au 12.99. The Red Dread absolutely zings with colour, humour and …pizzaz! It’s a great story, minimally told, that kids will adore. Morgan-Jones’s illustrations are hilarious, and contribute dramatically to the wonderful tension that builds as the story proceeds. The animals’ expressions, particularly their eyes, will have young artists inspired for sure. Teachers will immediately see the potential of The Red Dread as a choral piece or a piece of reader’s theatre. The wonderful “THUMP THUMP THUMP” begs to be an ostinato that gets louder as the tension builds, and there are lines for solo voices too. I would love to see young drama students choreograph and arrange the text according to their own interpretations too. The Red Dread is on my list of Perfect Picture Books for Performance. The Red Dread makes an excellent choice as a funny read-aloud. I also like the way it can serve as an introduction to discussing more serious topics with kids. Why is it that we fear strangers and things we don’t know? How do rumours start? What can go wrong when a rumour starts? Me Too is a children’s picture book by Erika Geraerts and Charl Laubscher, illustrated by Gatsby and published by Walker Books (2018.) RRP: $Au 24.99 HB. This is a perfect gift for kids and grown-ups who have found the kind of best friend that makes the world a little brighter. It applies to classic friendships, partnerships and marriages. A natural for Valentine's Day, this jacketed hardcover with an adorably-illustrated case cover is a gift to share with someone you love. There are a lot of books about who you want to be when you grow up, but there aren't book about who you want to be with – your best friend. That's what this book is about. Making sure you find the person who knows just when to say, "Me too." Me Too is a good choice for classes focusing on friendship, or wanting to celebrate positive relationships. The text is simple but it will resonate with kids because it really does distill the essence of friendship. It captures moments of commonality - like going on adventures, dressing up, helping out when someone is down - that both kids and adults can relate to. The illustrator has pictured the friends as a boy and a girl, and chosen a limited but fascinating palette of colour to work in. Many illustrations rely on black on white detailed sketches with an occasional block of colour. I wish I could describe the art work better - I liked it very much and found that it gently enhanced the story. What the Fluffy Bunny Said to the Growly Bear is a children’s picture book written by P Crumble, illustrated by Chris Saunders and published by Koala Books for Scholastic (2018.) RRP: $Au 16.99 PB. But when the message gets mixed up, there's confusion, chaos–and lots of fun. Chinese Whispers is always a fun game to introduce to kids. One person whispers a message in another’s ear, and so on along a line of people until the last person says the message aloud. Kids find it hilarious to discover how the message has changed along the way. What the Fluffy Bunny Said to the Growly Bear is a very simple picture book based on this concept. The message begins with “There’s a surprise birthday party for Zebra. Wear a hat! Bring a cake! Pass it on.” and then morphs into rhyming iterations such as “…wear a mat! Bring a plate!” The illustrations are lovely but I would have liked to have seen the kooky scenarios pictured more clearly for the intended audience of under 6’s. This picture book could work to not only show kids how communication can get stalled by different people hearing it incorrectly, but also to introduce or reinforce rhyming words.